Ocean Fish, Fish Broth, Shrimp, Calcium Phosphate, Vegetable Oil, Guar Gum, Vitamin E Supplement, Vitamin A Supplement, Sodium Nitrite (to Promote Color Retention), Zinc Sulfate, Thiamine Mononitrate, Manganese Sulfate, Menadione Sodium Bisulfite Complex (Source of Vitamin K Activity), Riboflavin Supplement, Folic Acid, Pyridoxine Hydrochloride, Vitamin D-3 Supplement. 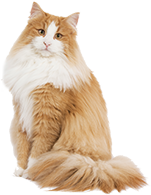 Feed an average size adult cat 1 can per 3-1/2 pounds of body weight daily. Feed up to twice this amount to kittens. 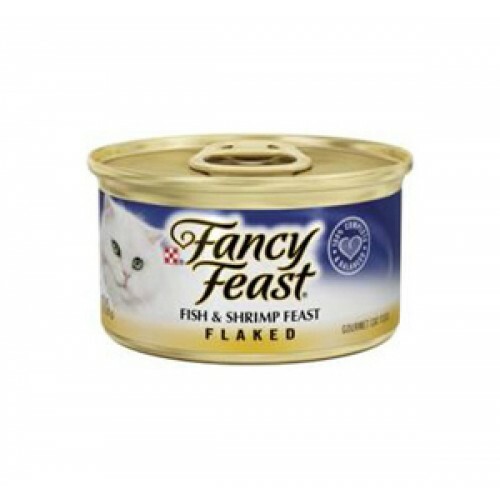 Fancy Feast Flaked Fish & Shrimp Feast is formulated to meet the nutritional levels established by the AAFCO Cat Food Nutrient Profiles for all life stages.